Using our touchscreen phones is a problem when the weather cools, but it's not just about staying connected. Our devices provide entertainment and distraction while we wait and commute, and when it's cold, that's a hassle. 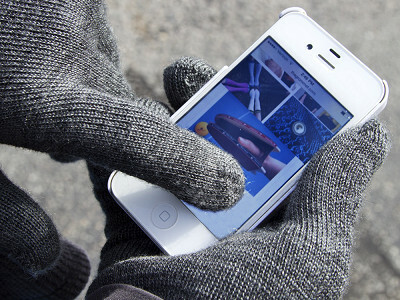 Glove.ly touchscreen gloves were invented so that you won't have to sacrifice warmth or style while you use your phone outside. 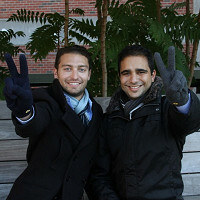 In fact, Sol and Oscar Hedaya created Glove.ly because they were surprised at the lack of warm, good-looking winter gloves for accessing your mobile devices. The duo craved good design, comfort, and functionality—not to mention warm hands—and Glove.ly hits the mark each and every time. Manufactured with an innovative Invisitouch fabric, the high-tech knit gloves ensure than any part of every finger and even your palm can navigate your touchscreen devices in all types of weather without removing your gloves. Stay warm, and in touch with Glove.ly. Hi - I'm Sol. Here at Glove.ly, we love balancing function, design, and technology. Your beautiful tech devices do that, and so should your accessories. But, since it's getting colder outside, you really need to keep your hands warm. Let me know if you have any questions about Glove.ly. Amy here from The Grommet. In our video, we mention a warmer, lined style of Glovely, and we're really excited to offer it. Unfortunately, we don't have these at the moment but hope to get them back in soon. We'll have these new styles available here as soon as they are available. In the meantime, though, unlined and classic Glovelys are perfect for these cooler, but not yet brutally cold fall days. @Amy: So what are the lined version of these gloves made of? Acrylic or wool or a blend? What is the lining made of? Also, what is the price???? While we don't have a confirmed date when they'll be available, we are hoping they will be available by the beginning of November. Stay tuned. They are made of a wool acrylic blend and have a polyester lining. I've tried them personally and they are very soft on the inside - you'll love them. ...And the price will be $29.95. We aren't selling xl or xxl right now but will update if that changes. They do stretch a bit, although I'm not sure exactly how large of hands your brother in law has. Amy will the lined gloves be available for Christmas presents? Hoping so yes. Stay tuned. Thanks for your interest! The lined version, Glove.ly COZY, will be available well in advance of the holidays so you'll be able to get them for your loved ones. We're super excited about them! Using our touchscreen phones is a problem when the weather cools, but it's not just about staying connected. Our devices provide entertainment and distraction while we wait and commute, and when it's cold, that's a hassle. Glove.ly touchscreen gloves were invented so that you won't have to sacrifice warmth or style while you use your phone outside. 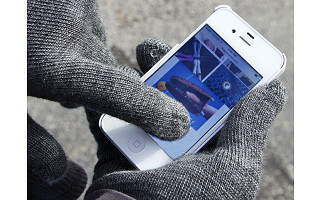 In fact, Sol and Oscar Hedaya created Glove.ly because they were surprised at the lack of warm, good-looking winter gloves for accessing your mobile devices. The duo craved good design, comfort, and functionality—not to mention warm hands—and Glove.ly hits the mark each and every time.